JA Rodgers’ beautiful Spirit left this earth on Sunday, January 20, 2019. Jeff was the beloved husband and sweetheart of Donna Meyers Rodgers. 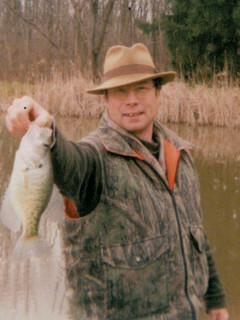 He was an avid fisherman who loved being outdoors in nature. He was a true baseball fan and devoted animal lover. Jeff had a passion for acting and performed in over 65 plays in 25 different theaters, winning several awards for his character portrayals. Saving and protecting the environment and the planet were very important to him. Jeff was creative, a most resourceful person and an excellent cook. He was so fun and funny and loved to make people laugh. Jeff was a proud Charter member of the Rock & Roll Hall of Fame. His Communications degree was earned from Cleveland State University. The youngest of seven children, he is survived by all of his siblings, many nieces and nephews and his wife of 25 years. Also by his adoring rescues; Seanny, Happy and Billy aka Lion. A Celebration of Life party to honor him will be scheduled for a future date. Prayers are with you and your family. My God surround you with peace and comfort.